The MetroPhoto 4x6 style is a high quality 4x6 photo professionally printed on Kodak Professional Endura photo paper with a matte finish. Price includes white envelopes. Orders ship 3-5 business days after your proof is approved. The MetroPhoto 5x7 style is a high quality 5x7 photo professionally printed on Kodak Professional Endura photo paper with a matte finish. Price includes white envelopes. Orders ship 3-5 business days after your proof is approved. The MetroCard style is a 2 sided, 5x7 card. It is press-printed on 110 lb. cardstock paper with a matte finish. The design is carried over onto the back and includes an additional photo and a small metrobabycards.com logo. Price includes white envelopes. Orders ship 3-5 business days after your proof is approved. 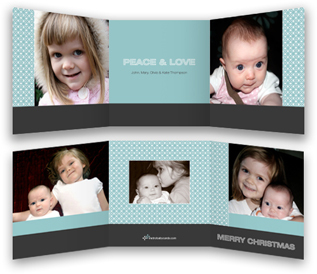 The Trifold style is a 5x5 folded card that opens up to 5x15 size card with 6 total panels. It is press-printed on 110 lb. cardstock paper with a matte finish. Price includes your choice of 5x5 or 5x7 white envelopes*. Orders ship 3-5 business days after your proof is approved. *5x5 envelopes require 64¢ postage to mail. 5x7 envelopes require the standard 44¢ postage. Our Thank You Cards coordinate with every design we offer. They are 4x5.5 foldover cards press-printed on 110 lb. cardstock paper with a matte finish. The design is carried over onto the back and includes an additional photo and a small metrobabycards.com logo. The inside is blank. Price includes white envelopes. Orders ship 3-5 business days after your proof is approved. 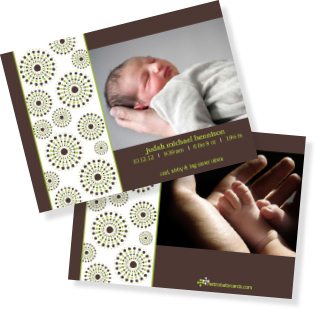 *Please note that Thank You Cards are printed using a different printing process than the MetroPhoto 5x7 and MetroPhoto 4x6 styles. 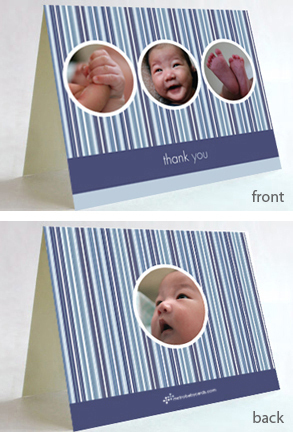 Colors on the Thank You Cards may not match exactly with colors on the MetroPhoto 5x7 and MetroPhoto 4x6 styles. Our Return Address Labels coordinate with every design we offer. They are 3.5x2 (business card size) peel and stick labels and are best suited for the back of your envelopes. U/V coating is included in the price. Orders ship 3-5 business days after your proof is approved. *Please note that Return Address Labels are printed using a different printing process than the MetroPhoto 5x7 and MetroPhoto 4x6 styles. Colors on the labels may not match exactly with colors on the MetroPhoto 5x7 and MetroPhoto 4x6 styles. 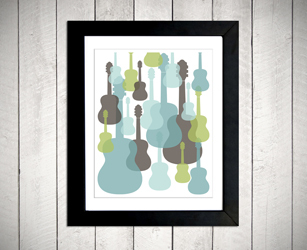 Our Modern Nursery Art line is available in 11x14 and 16x20 sizes. 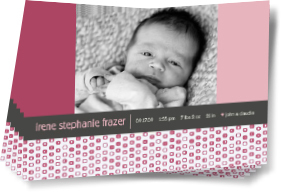 The designs are printed on Kodak Professional Endura paper with a matte finish. The prints are mounted on sturdy 2mm white plastic styrene for added durability and ease of framing. Prices are for the print only - frame and mat pictured are not included. Personalized prints ship 3-5 days after proof is approved. Non-personalized prints do not require a proof and ship 3-5 days after order is placed. 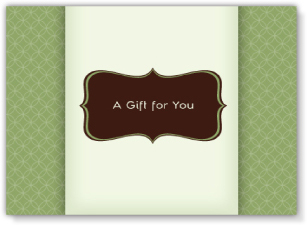 Gift Certificates can be ordered in any dollar amount, and can be used to purchase any items on our website. 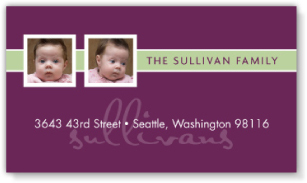 The gift certificates are 4x5.5 foldover cards press-printed on 110 lb. cardstock paper with a matte finish, just like our Thank You Cards. We can mail it to you, or straight to the recipient. 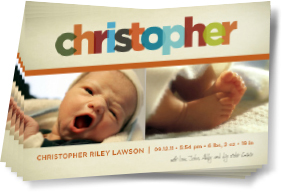 Gift certificates make great baby shower presents too! All USA orders are shipped via either UPS Ground or USPS Priority Mail and will arrive 2-6 business days* after your proof is approved and your order is sent to print, depending on your location. International orders are shipped via USPS First Class International and take 6-10 days* to arrive to most locations. Other Countries: Please e-mail us for a shipping quote. 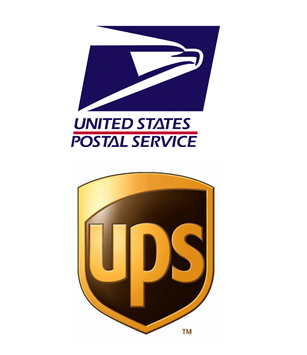 *During the holiday season shipping time can be a day or two more due to the heavy volume of UPS and USPS. The customs process may also delay the shipping time of your order. We have no control over customs.